In spite of its wintry beginning today, the weather is not expected to be bad this afternoon or evening, so this evening's presentation will go on as planned! 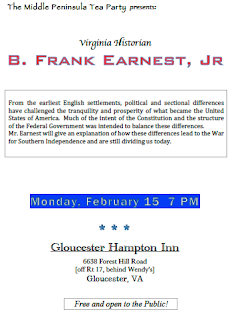 SCV member B. Frank Earnest is looking forward to presenting his fascinating interpretation of history from a Virginian's perspective Monday evening at 7 PM at the Hampton Inn in Gloucester. 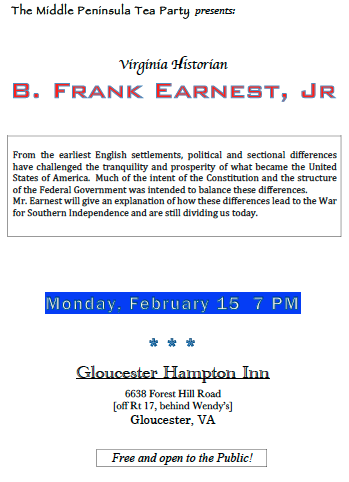 Frank has a reputation for telling history with more than just facts and events. He tells the stories behind the events and facts. A question and answer session will follow. Coffee and tea are available in the hotel lobby. The doors open at 6:30 pm and the program begins promptly at 7. This program is brought to you by the Middle Peninsula Tea Party. We hope you will join us & bring a friend!